Each year, August 16 is the anniversary of Elvis Presley’s death. Although Elvis fans generally prefer to recall happier times in Elvis’s life, they should allow themselves one day each year to look back on the events that led up to his untimely death. Although most Presley fans choose not to dwell on it, Elvis’s self-destructive behavior near the end of his life is an integral part of his great American story. “Elvis Forty and Fat”—That headline over a brief article in my local newspaper on the morning of January 8, 1975, startled me. How could Elvis suddenly be overweight? When I saw him on stage in Seattle in 1971, he was lean, energetic, and handsome. He was just as slender in his 1973 Aloha From Hawaii TV special. All the cover pictures on his records over the next two years showed the same sinewy Elvis. And now he’s let himself go? At first, I couldn’t and wouldn’t let myself believe it. 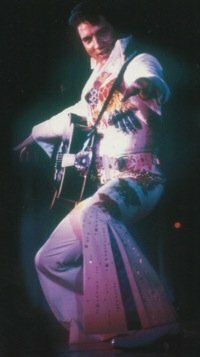 In April 1976, though, I was forced to believe it when Elvis walked on stage at the Spokane Coliseum. 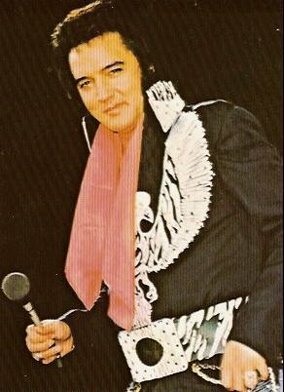 Honestly, at first I thought he had tucked a pillow under his jumpsuit as a joke, but when the pillow never came out, it became painfully obvious that Elvis had lost control of his waistline. Still, like most Elvis fans, I was absolutely stunned at learning of Elvis’s death a year later at the age of 42. Surely, carrying some extra weight couldn’t be enough to end the life of a man so young. Most of us, though, had known nothing of the other destructive habits and illnesses that slowly and inevitably led to Elvis’s death. In turns out that the drug use, the hospital stays, and the bizarre behavior, both on and off stage, had been shielded as much as possible from public view by a group of conspirators who benefited from a perceived healthy and working Elvis. They included Colonel Parker, RCA, Presley insiders, and even Elvis himself. And, of course, we fans, with our unwillingness to surrender our dreams of a forever-young Elvis, were unwittingly co-conspirators as well. What if Elvis’s fans had been more alert, though? Could we have somehow been aware of Elvis’s physical decline and done something to help save him? Could we have put the puzzle pieces together? Maybe the answers to those troubling questions are somewhere in the hundreds of articles published about Elvis from his 40th birthday in January 1975 until his death two and a half years later. Of course, “social media” didn’t exist back then to bring news and rumors about Elvis to us in real time. The best national sources of information about Presley were entertainment journals like Variety and Billboard. As fans, though, and not industry insiders, most of us didn’t read those sources. If we had, though, what would we have learned about Elvis’s deteriorating health? Let’s go back and take a look at what they were reporting about Elvis’s public and private life from 1975-77. The Variety article reveals how those close to Presley at that time obviously withheld news from the public about Elvis’s health, even to the point of providing misleading and false information. That perilous strategy would continue until the day Elvis died. Elvis had 2 ½ years left to live. The Press-Scimitar article, again, was based mostly on speculation and dissembled information. For those willing to admit it, though, it should have raised another red flag about Elvis’s health. He had just 6 ½ months left to live. In its May 18, 1977, issue, Variety reported that three men had sued Elvis Presley for $150,000 over his withdrawal of personal and financial support for a planned racquetball and handball courts business in Memphis. Although no direct connection to Elvis’s health is mentioned in the article, it was not a good sign that one of the trio suing him was his personal physician, the infamous Dr. Nick. Elvis had 3 months to live. Writer Marty Bennett noted that “Presley was heavy-eyelided and appeared to most observers to be weak and tired.” The first 30 minutes of his show included “anemic singing, a few stilted attempts at his patented gyrations, bewildering patter and awkward stage movement that included having an aide hand-hold his voice mike.” Then the “paunchy and apparently pained” Presley walked off stage without explanation, leaving his side musicians to cover for him. 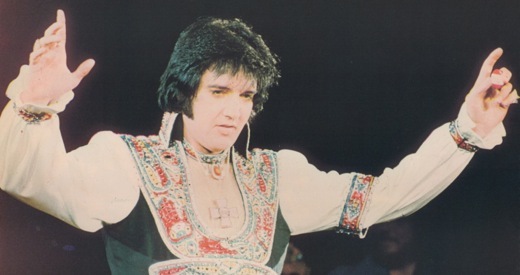 When he returned to the stage, Elvis explained he had left for two reasons—“a twisted ankle and nature calls.” A Civic Center spokesman later said Presley was on medication and had been treated by a doctor during his absence from the stage. 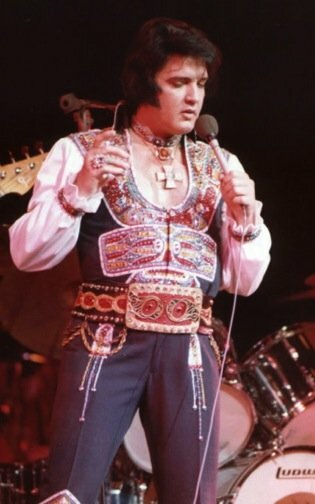 Although Elvis later told the crowd, “there’s nothing wrong with my health,” Bennett noted that “patrons exited shaking their heads and speculating on what was wrong with him.” There was obviously more “wrong with him” than any of them, or us, knew at the time. 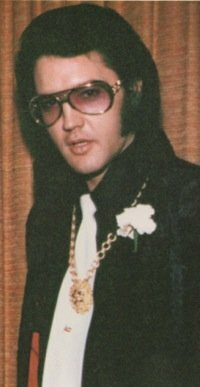 Elvis had 2 ½ months left to live. • Why did Elvis die? “Presley was overweight at his death, a problem he had fought for several years. Rumors circulating in the music and recording industries in Memphis and Nashville are to the effect that Presley had cancer and was taking cobalt treatments, which were causing him to gain weight. “Another rumor was that Presley knew he had a terminal illness and was being religious of late and reading the Bible a lot. Neither of these two rumors could be confirmed. Over the next couple of years, most Elvis fans were forced to accept, reluctantly, that drug use was probably the major factor in their idol’s early death. Those of us who lived through those cruel days have long since chosen to concentrate our memories on the gifted and generous sides of his character. "Those close to Presley obviously withheld news from the public about Elvis’s health, even to the point of providing misleading and false information. That perilous strategy would continue until the day Elvis died."